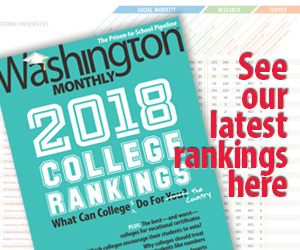 Washington Monthly | Froomkin out? FROOMKIN OUT?…. When it comes to the paper’s online presence, the Washington Post has made some very smart moves in recent months, most notably the additions of Greg Sargent’s “The Plum Line” and the Who Runs Gov project, and Ezra Klein. But this move, if accurate, is a step in the wrong direction. In a move sure to ignite the left-wing blogosphere, washingtonpost.com columnist Dan Froomkin (author of the “White House Watch” blog) has been let go by the news organization, POLITICO hears. In so many words, Froomkin was told that his blog had essentially run its course. I haven’t seen official confirmation of this, but if Froomkin is leaving the Post, it’s a real loss. Froomkin has been a great writer with keen instincts, often picking up on a burgeoning story before it’s gained traction elsewhere. The Politico says the move is “sure to ignite the left-wing blogosphere,” but Froomkin’s departure, if true, should disappoint anyone concerned with insightful political analysis. Indeed, far-right complaints notwithstanding, Froomkin has spent months scrutinizing the Obama White House, cutting the Democratic president no slack at all. Just over the past couple of days, Froomkin offered critical takes on the president’s proposed regulations of the financial industry, follow-through on gay rights, and foot-dragging on Bush-era torture revelations. Froomkin was one of the media’s most important critics of the Bush White House, and conservative bashing notwithstanding, was poised to be just as valuable holding the Obama White House accountable for its decisions. If the report is correct, I’m sorry to see him go. Update: I’ve spoken to Dan, who confirmed that he is, in fact, leaving the Post. “I’m terribly disappointed,” he said. “I was told that it had been determined that my White House Watch blog wasn’t “working” anymore. Personally, I thought it was still working very well, and based on reader feedback, a lot of readers thought so, too… I also thought White House Watch was a great fit with The Washington Post brand, and what its readers reasonably expect from the Post online.